Everyone knows that ads on Facebook, Twitter and Linkedin can be a great way to reach your target market and to help further drive sales. But, ad campaigns are no longer just for the marketing team. Ads can be used to reach a completely different, but equally important, group of people for your company. Take a look at the image above. That’s an ad I was served trying to get me to become a driver for Uber. They are staffing up big time to meet demand and so are turning to every possible channel to get more drivers on the road. In addition to spending millions of dollars a year on Craigslist, they’re investing heavily in ads on Facebook and Twitter as part of their recruiting strategies. This doesn’t just work for companies valued at 40 billion dollars however. It can work even if you’re a small, cash-strapped startup. Especially in technology and for roles like developers and designers, competition is fierce among companies to find the best talent. And if you’re just posting a job description on your site and submitting it to a few job boards, chances are that you’re most likely missing out on a TON of great candidates. For example, Snapchat is in such demand for top talent that they created a special geographic filter just for Uber’s headquarters so that Uber’s employees would see it – and hopefully check out the jobs page at Snapchat. So what’s a hiring manager to do? Let’s say that you work at a tech company in NYC and you need to hire a developer. All the normal shot-in-the-dark strategies. All immensely time consuming and all deliver average results. Now, let’s take your recruitment process to the next level. In addition to the above you could setup a few social ad campaigns to advertise to developers in the NYC or surrounding area. But for the example, I’m going to walk you through how it works on Facebook. 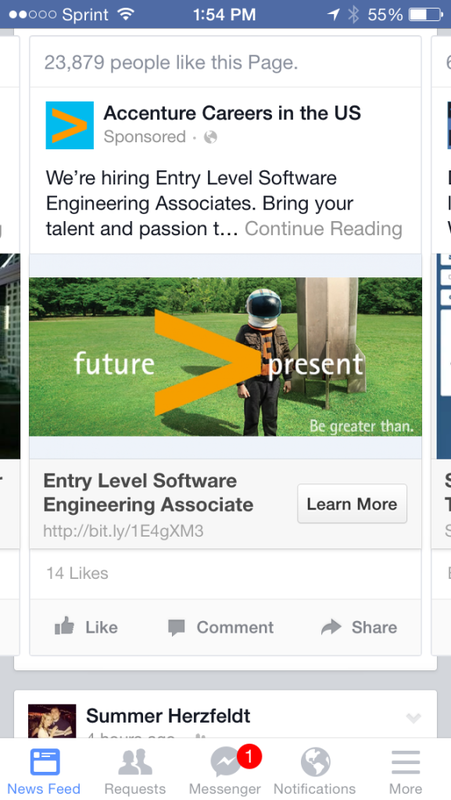 Here is an example of an ad from Accenture looking to hire entry level software engineers. Their targeting for it is off however because I can’t write a single line of code! We’ll dive into how to properly target the right candidates in a minute. The first step to any good ad, whether it’s to drive sales or attract quality job applicants, is to identify what’s your unique value proposition. In this case, you need to answer why should someone choose to work at your company vs. anywhere else? What can you offer that nobody else can? Why should they act now? How much job security is in the position? How much visibility does the position attract and how competitive are the salary and benefits? How rewarding the position will be and how much opportunity there is to lead and grow? In Made to Stick they discuss a study that shows when people were asked which of the 3 above would be most motivating for them personally, they choose number 3. However, when asked which they think would be most motivating for other people they choose 1 or 2. We like to think that our needs and wants are different from others, but they’re usually the exact same. This is why you see most job descriptions focusing on numbers 1 and 2. Because even though we think #3 is most motivating for us, we use a #1 or #2 appeal because we think that’s what others will respond best to. Sure, security and high pay are motivational. But when we focus solely on those we miss out on opportunities to tap into more profound and powerful motivations. After you’ve thought deeply on the above, we can head over to Facebook to create our campaign. The first step is to choose where your ad will link out to. It can go straight to the page on your site with the job description. Or it can go to a more general careers page that shows off your company culture. Well known companies: I think if you are a well-known company you’re safe with sending them straight to the job description page. Lesser known companies: But, if you aren’t a household name just yet and people aren’t aware of the benefits of working for your company, you may want to send them to the careers page first. If your company is in NYC, you may want to focus only on people in the area. Or if you want to expand your reach, you can easily do that to the surrounding regions. 3. Enter your ad copy. It should hit on the things we talked about above. 4. Upload an image for the ad. You COULD go the easy route and just use your logo, although if you’re reading this you probably aren’t that lazy. 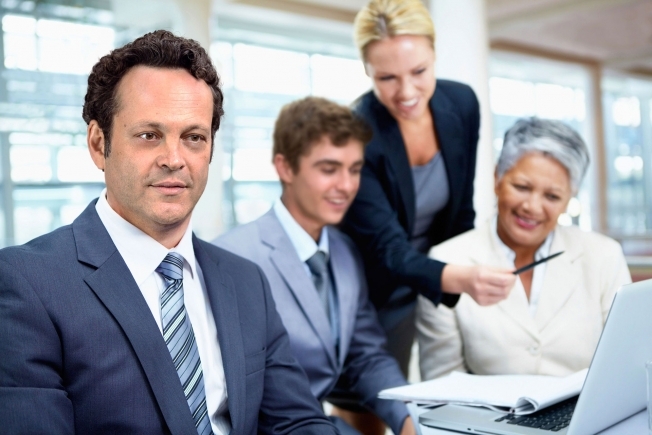 So I recommend using a high quality image that shows off your office, or your team. Show what makes working at your company unique. Now you can start targeting people who are likely to be developers. On Facebook, we have a variety of options. Target people by their major. Ex. Computer Science grads who’ve been out of school for 6 years. Target people by their job description. Ex. ‘web developer’, ‘software engineer’, ‘iOS developer’ or whatever is most suitable for you. If there are specific technologies you’re looking for, like developers who know Ruby on Rails, you could enter that in the ‘interest’ category. Keep in mind this will exclude a fair amount of developers who do actually know Ruby on Rails but Facebook just doesn’t have that data on them. So use that option at your own discretion. You can even target developers who work at particular companies or competitors. 6. Now you’re ready to launch! How Much Does it Cost? How Much Should I Spend? An average cost per click on Facebook will range from $.5 to $1. This means you can get a (highly targeted) candidate to look into your open position for just 50 cents to a dollar. It costs $399 to post a job on Linkedin. If you spent $400 on Facebook ads, you could lead anywhere from 400 to 800+ potential candidates directly to your open position. Want help setting up a recruiting ad campaign? Email Ben@Biddyco.com for more info. If you’re in a talent war with your competitors, you need to step outside the traditional recruitment box. With the ability to laser target in on the right people on social networks, you can be proactive and affordably advertise to potential candidates.